Mid to upper 50s tomorrow through Monday here. Chance of rain Saturday and Sunday. That’s okay, it’s been dry for quite awhile. A bit of rain will help get rid of the remaining snow and help to start greening things up where the snow is gone. I think the shorts and tshirts might come out for 1 day finally. Too bad it doesn’t last. 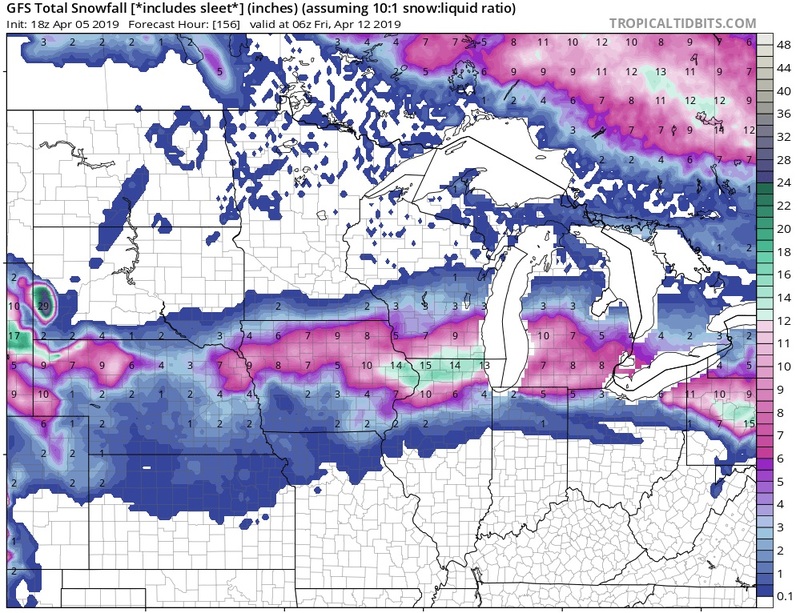 Can’t wait…big ole stinky snowstorm heading for the midwest? Late next week be on the look out. Highly suspect these snowfall totals, but funny to see. Wunderground calling for 13-20" here next week Weds.-Thurs. NWS only has relatively low chances of rain/snow mix. That’s me right in the crosshairs! Finally going to be able to leave out the indoor plants overnight…tonite a low of 53F and Sunday a low of 45F… should be fine for even the tropicals. The 6z GFS totally flipped…which is a sign these models are still all over the place…although looking at the Euro…it also flipped hard north…so who knows. It has 30 inches of snow just north of Minneapolis… no…no no no… the river is just starting to come down. The models are horrible this time of year. Until we get beyond the spring predictability barrier I wouldn’t put much stock in them. I’ve still been following the Oroville Dam some…i see they opened the new spillway to water flow. That was a pretty massive project they did in a quick amount of time. Hopefully its all good now. I think citrus are pretty hardy? I have a seedling grapefruit that is about 3feet tall now. A few of my potted strawberries in 1 gallon pots are pushing new leaves after spending winter in the garage. A good sign. Looks like mid 60Fs will be about where we get today…still feels nice. still below average at low 40’s melting has slowed. big storm by weds. supposed to drop 8-10in. winter isn’t done here yet. Below average highs. 50’s for the next three days. Will finish pruning! And no wind!